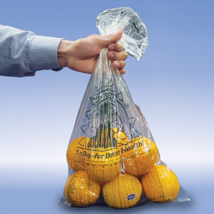 The Produce Bags are imprinted with a 5 a day graphic and would be great in the produce department. Our bags are made of virgin food grade resin and/or FDA approved resin safe for food contact, no recycled content or fillers. 11 microns.